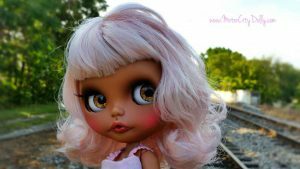 Gwen, my newest custom Blythe, is a dark skinned girl with pale pink hair. I love the way this girl can go from sultry to sweet in the blink of an eye. She’s available for adoption in my shop. Next PostNext The Pope Lick Monster!